It's a rainy chilly Saturday, a reversion to almost winter weather for Atlanta (high in the 50's, which we can get in January and February). It will be back close to 80 by the end of the week, though. The cats sleep in all day, of course, but on sunny days the window cat beds tend to be popular. Today's one of the few times all 3 cats have been in the newish bunk bed I put together for them. 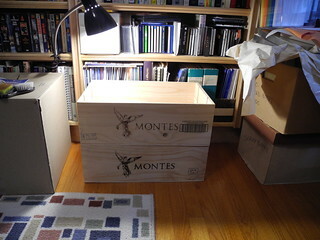 The bunk bed began with 2 wood wine boxes thrown out by a neighbor, which I picked up during a walk. They sat stacked on the study floor for quite a while, accumulating some bedding and a clamp-on light for heat, and proved a popular sleeping spot when I'm at the computer and the cats are hanging out with me. 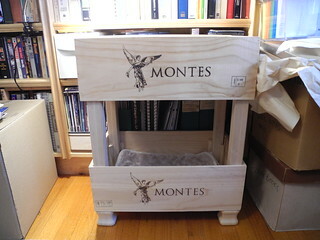 I spotted a bunk bed idea on some feed or other made from 2 halves of an old suitcase, premade spindles, and bun feet. I pinned it on my tiny Pinterest board (though I see the link is now dead, this is similar), and thought about applying the idea to the wine boxes. I think about such things a lot....but mostly never do anything about it. This one, however, I finally tackled a couple of months ago. A trip to Home Depot for the legs and feet, plus quarter-round molding to use for support on the legs--I was dubious that they would hold against the forces and wiggles of cats jumping into the top bed--a little pondering of placing the supports, nailing and glueing, a little effort to put the pieces together from where my measurements weren't quite exact, and voila! the double bed. 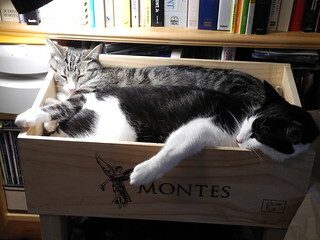 And the crowded conditions in the top box under the lamp. Trilla (the tabby) was there first, and Fish was in the desktop cat bed under the other lamp. He moved to the sofa for a while to cool off, then apparently decided that the bunk bed was better. Now, an hour after I took this shot, Fish is in sole possession of the top bunk and Trilla has moved to the desktop bed. Fred still occupies the bottom bunk. 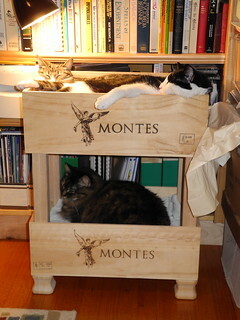 You have obviously spoiled, equally obviously happy cats [g]. And if it keeps raining, it could double as a boat!!! That looks like a very nice cat bed. How clever and resourceful of you! Your feline overcats are very well served, indeed.